The all-star cast and showrunners revealed new details about the highly anticipated spinoff of Titans, including why it's actually not really a spinoff of Titans. There's a lot you should know about DC Universe's latest series Doom Patrol, like the fact that there's a farting donkey. Or a Christian evangelical cockroach preparing for the end of days. Or that it's all actually narrated by the villain. And that's only the tip of the iceberg that is the crazy, hilarious and meta new DCTV show that begins streaming Feb. 15. But perhaps the most important thing to know about Doom Patrol can be summed up by this quote from series star Brendan Fraser: "This ain't the Justice League." Fraser along with his Doom Patrol co-stars Timothy Dalton, Alan Tudyk, Joivan Wade, April Bowlby and Diane Guerrero, as well as showrunners Jeremy Carver and Sarah Schechter, hosted a panel at the 2019 Winter Television Critics Association press tour on Saturday and finally revealed exciting details about the highly anticipated follow-up to Titans. "It's a show about a group of reluctant heroes who are content living in isolation, until they’re called upon to rescue a world that has long shunned them," Carver teases of the overall season one arc. But while Doom Patrol has long been called a spinoff to Titans, Carver says that may not be the best way to describe the new series, despite most of the same characters (and the same actors playing those characters) having first appeared on the earlier DC Universe series. "There are elements that were present in the Titans Doom Patrol [episode]," he says. "But I think everyone is best suited coming into this Doom Patrol understanding that we have our own continuity and our own story. And if you come in with a fresh perspective, I think that’s the best way to view this Doom Patrol." The Doom Patrol first appeared in publication in 1963, and since then there have been many different iterations of the anti-superhero team of superheroes. "This show is dipping into different versions of the Doom Patrol from the years," Carver reveals. "A great jumping off point is the Grant Morrison run in the '90s. We dip into the Silver Age where we are seeing the Celsius and Lodestone characters. We're going to see some other characters [from] over the years, such as Danny the Street. We're going to see one of my more beloved characters, the Beard Hunter." One of the most anticipated characters showing up in Doom Patrol's second episode is none other than Vic Stone, aka Cyborg, played by Wade. 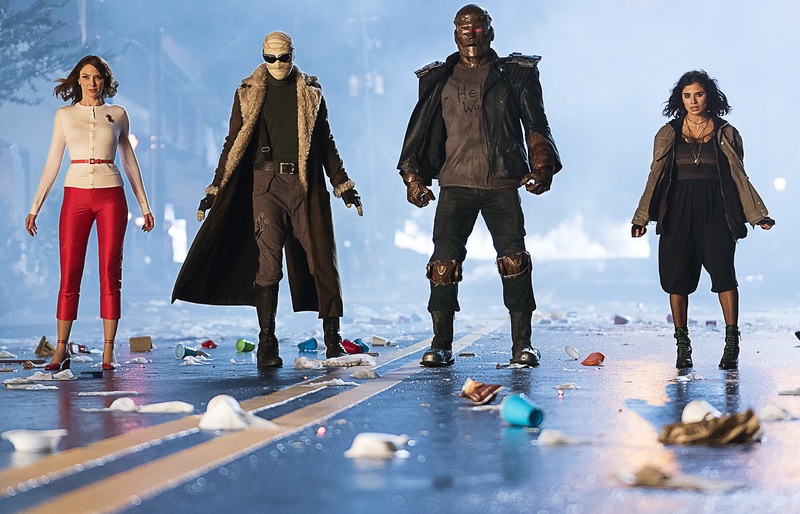 Since Cyborg is a part of the Teen Titans in the comics, fans assumed the character would show up in the first season of Titans, but DC Universe decided to hold onto that reveal until Doom Patrol. "What's really exciting is the fact that you've got The CW world in its own universe, but this new DC Universe is another opportunity for us to be able to cross over and essentially live in a world which hasn't been seen," Wade says. "When it comes to Cyborg specifically, we're in a world in which it's a different version than we've seen in the past, be it in Justice League or any other version. It's a great opportunity for me, personally, to be able to have my own take on it and really bring it to life in a way that hasn't been seen yet." So, what does that mean exactly? "This is an earlier Cyborg," Wade explains. "It's a version of him in which he's coming into his powers, and essentially he's a long way off of the Justice League if you will. You can really see a clear distinction between this version of the character and other versions." Fans can now add Cyborg to the growing list of DC characters being portrayed by two separate actors on the big screen and small screen, as Ray Fisher continues to play the half-man, half-robot in the DC films. "DC has made a decision, quite smartly, to separate the feature world and the television world," Schechter says. "I don't think there's been any confusion. And comic books have always had multiple versions of the same character, created by different writers, different artists, with different adventures. I think that the two [versions] work really nicely together, and help fans to experience fully the characters that they love." On the surface, Doom Patrol is going to be unlike any other comic book property adaptation you've ever seen. Even structurally, the series is going to take fans by surprise. This is evident as early as the first episode, where the introductory hour subverts expectations by telling each Doom Patrol member's origin story immediately and quickly so the real adventures can begin. "Because we were dealing with particularly two characters who you couldn't see, one wrapped in bandages and one inside a robot’s body, I felt it was really important that you get a very good grounding of not just those two characters, but all the characters, so that you are fully behind everybody in this story," Carver explains. "You needed to feel the people who were under those bandages and inside that robot’s body." Since all of the origins of the Doom Patrol members are tragic in their own ways, be prepared to cry. A lot. But you'll also weirdly laugh while crying, and that's all thanks to Tudyk's hilarious voiceover. In Doom Patrol, the villain of the story, Mr. Nobody, is shockingly the narrator as well. "I thought it would be fun to start with the sort of basic notion of someone telling almost like a fairytale, but from the villain's perspective," Carver says with a laugh. "And it's not just for show in episode one. It very, very much goes to the heart of what Mr. Nobody's intent is this season." "I really like the writing for the voiceover of the show," Tudyk says. "Since he is the villain and he has disdain for a lot of these characters, he doesn't hide it. He's not this omniscient character who's like, 'And then this happened.' He's saying, 'The team of superheroes, oh god, another team of superheroes, shoot me! Have you hung yourself yet?'" But is he a reliable narrator? You'll have to decide for yourself when Doom Patrol begins streaming Feb. 15 on DC Universe. Not yet subscribed to DC Universe? Click here to change that!